Thumbnail files names are created from a user-defined template. This template can be modified in the Thumbnail file names window. To open this window go to the Options step, select the Thumbnails tab and click the Thumbnail file names... button. Thumbnail file names template can contain image special tags. 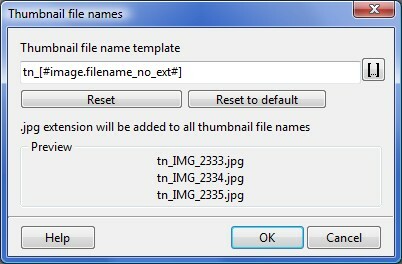 It's recommended to use [#image.filename_no_ext#] special tag to make thumbnail file names using real image file names.